2 What is time perspective? On one Sunday morning, you were sitting on your couch and thinking about next Sunday you will be in a trip to the beach. Some people might feel happy and expect the trip but others are not. In this scenario, "the next Sunday" is your future time zone and the moment you were sitting on you couch was your past, and at this moment you reading this chapter is present. Some people feel happy maybe simply because they are past positive person or present hedonistic person while those who do not feel happy might because they are past negative or future oriented person. In this book chapter, the relationship between happiness (well-being) and time perspective (past, present and future) as well as balanced time perspective are discussed. Furthermore, five dimension of time perspective, namely Past-Negative (PN), Past-Positive (PP), Present Hedonistic (PH), Present-Fatalistic (PF) and Future (F) are also investigated. By the end of this book chapter, you should be able to find your answers and know about the relationship between different time perspectives and happiness. By the end of this book chapter, you should be able to answer these questions and find greater happiness. What is the relationship between time perspective and happiness? How can time perspective be used to increase happiness? 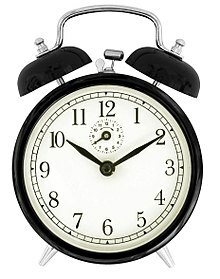 In 1951, Lewin suggested that time perspective (TP) plays an important role in psychology and influences emotion, motivation and behaviour (Lewin, 1951). The concept of TP is divided into three time frames in which people would form expectations or carry out activities, i.e. past, present and future (Bergadaà, 1990). Moreover, TP establishes cognitive guidelines to help individual form psychological concepts of past, present, and future (Boniwell, 2005). The development of TP represents a fundamental role in social goals and is also influenced by factors like culture, education, and socialising (Zimbardo & Boyd, 1999). As the interest in studying time has been increasing, different conceptualisations and constructions of TP have emerged (Shores & Scott, 2007; Zimbardo & Boyd, 1999). For example, TP is interchangeable with other terminology, namely time orientation, time attitude, and temporal orientation (Hulbert & Lens, 1988). For a consistent and sensible study on TP, it is necessary to have a well-defined measurement system. There are many tools for measuring TP, including the Time Structure Questionnaires, Future Anxiety Scale, Future Event Test. The most popular measurement is the Zimbardo Time Perspective Inventory (ZTPI) which has superior psychometric properties (Bond & Feather, 1988; Boniwell et al., 2010; Kastenbaum, 1961; Zaleski,1996). According to Haybron, happiness is an emotional state rather than an experiential state. More specifically, people who maintain happiness are labelled with his/her emotional state not an experiential state (Haybron, 2005). For example, a person may be under an anxiety state, but may not experience anxiety. Human emotions are too rich to only consider the experiential surfaces (Haybron, 2005). Generally, conceptualisation of happiness can be categorised into two types, subjective well-being (hedonia) and psychological well-being (eudaimonia) (Waterman,1993; Ryan & Deci, 2001). Among the two types of conceptualisations, subjective well-being (hedonia) emphasises on positive emotions and a judgement of life satisfaction while psychological well-being (eudaimonia) refers to people entirely engaging in life activities that produce feeling of authentic and being alive (Diener 2000; Ryan & Deci, 2001). Since happiness is a rather abstract and subjective concept, there is no a single unified definition of happiness. In most cases, happiness and well-being are often referred as synonymous and interchangeable (Diener et al., 1985; Delle Fave et al., 2011). Nevertheless, many believe that happiness is part of well-being and that well-being represents a broader construction and could have various meanings from different perspectives (Delle Fave et al., 2011; van der Deijl, 2016). Typically, subjective well-being includes three main constructs: positive affect (presence of positive mood), negative affect (absence of negative mood) and life satisfaction (Arthaud-Day, 2005; Diener et al., 1999; Ryan & Deci, 2001). Five TP dimensions (features or sub-scales) are included in ZTPI: Past-Negative (PN), Past-Positive (PP), Present Hedonistic (PH), Present-Fatalistic (PF) and Future (F) (Zimbardo & Boyd, 1999) as seen in Table 1. Empirical studies have shown that the five TPs have different implication for different aspects of well-being (Drake et al., 2008). Various studies have shown that there is a correlation between time perspective and happiness. For instance, people who have high level of PP are associated with high scores of self-esteem and happiness and the PP sub-scale had the strongest relationship with subjective happiness (Zimbardo & Boyd, 1999; Boniwell and Zimbardo,2004; Drake el at., 2008). In contrast, people who are more inclined to PN are associated with depression, low self-esteem and tend to have more involvement in gambling, alcoholic abuse and taking drugs (Klingeman, 2001; Wassarman, 2002; Zimbardo & Boyd, 1999). Further studies showed that people who seek more risky activities with high level of PH are generally happier than people who are dominated by PN (Drake et al., 2008; Boniwell & Zimbardo 2015). Interestingly, people who are strongly Future oriented have a negative relationship with subjective happiness (Boniwell & Zimbardo 2003). Past-negative (PN)] “a pessimistic, negative, or aversive attitude toward the past” p. 1277 Some traumatic events possibly happened in the past that result in pessimistic attitude. PN persons are afraid of trying new thing. Past-positive (PP) “glowing, nostalgic, positive construction of the past” p. 1278 Sentimental, warm and positive, stands out relationship between friends and family. PP persons are embracing more positive attitudes. Present-fatalistic (PF) “that the future is predestined and uninfluenced by individual actions, whereas the present must be borne with resignation” p. 1278 Lack of hope and belief, for life and future and reveal life is fatalistic or uncontrollable. PF persons lack of personal efficacy. Oriented toward present pleasure and embrace with risk and excitement but less concern future consequence. PH person are living for the moment. Based on the ZTPI, What kind of person are you ? As suggested by Zimbardo and Boyd, the theory of TP is associated with our interpersonal relationship, decision making and self-image. The formation of TP is influenced by different factors such as social, cultural, age and other environment factors. Zimbardo and Boyd further pointed out that people is[grammar?] potentially to develop a particular temporal time bias. For example, young adult[grammar?] with high PN and PF experience more feeling of depression and anger (Zimbardo and Boyd, 1999). It is consistent with the study that older person with high PF have obvious depression symptom and those with high PN generally have low level of life satisfaction (Desmyter & De Raedt, 2012), which leads to the well-accepted conclusion of negative relationship between PF and subjective happiness (Drake el at.,2008). Even though some other studies illustrated that future TP can lead to positive functioning and higher academic achievement (Kazakina,1999; Zimbardo & Boyd,1999), Boniwell and Zimbardo have pointed out that focusing too much on future goals would undermine the present enjoyment (2003). For the sake of having psychologically healthy individuals and a harmonious society, BTP is necessary to be investigated and promoted (Zimbardo & Boyd, 1999). People with a BTP are able to handle past present and future time perspectives simultaneously[factual?]. More importantly, BTP is associated with the capability that people could flexibly switch between each TP and use the appropriate one depending on different situations (Boniwell & Zimbardo, 2003). For instance, students who have a BTP may fully concentrate and place extra efforts on study to achieve HD in their final exams, celebrating after the exam even [missing something?] the result has not released, and enjoying the time with their families and friends during exam preparation. According to Zimbardo and Boyd (1999), BTP is vital to optimal functioning that people with BTP have a positive attitude toward their past, appreciate the present and strive for their future goals. People who have BTP acknowledge that they know what to do and how to do among different TPs, in other words, they work hard and play hard respectively (Boniwell & Zimbardo, 2003). Empirical research has concluded that there is a significant positive relationship between BTP and subjective well-being (happiness). For example, people who have a higher level of BTP also get higher scores on happiness and self-esteem from Webster's study; higher subjective happiness and mindfulness according to the research from Darke et al. ; gain more life satisfaction, subjective happiness, and satisfaction of psychological needs etc. according to the study from Zhang et al. (Drake et al., 2008; Webster, 2011; Zhang et al., 2013). Therefore, it is recommended to have a balanced time perspective to have best optimal well-being. 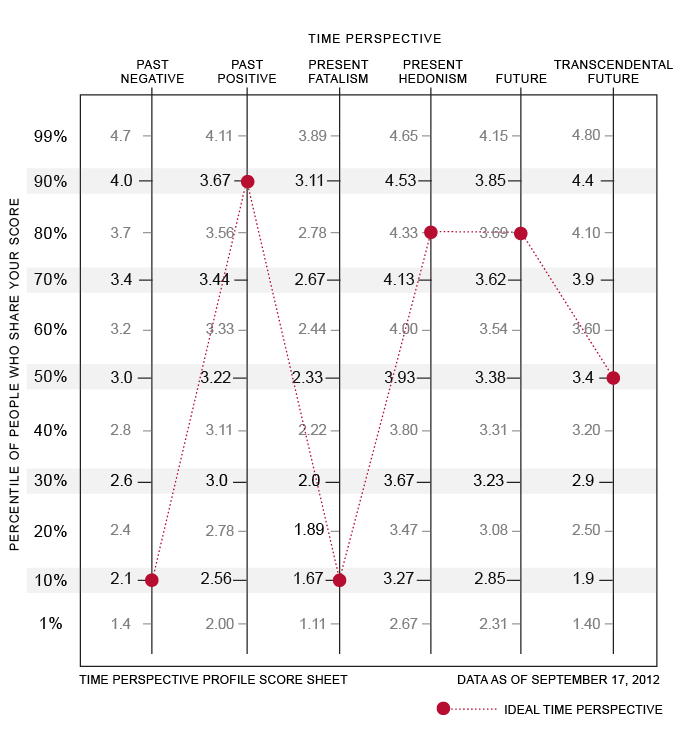 Based on the experimental data and ZTPI framework, Zimbardo and Boyd have proposed how an ideal BTP profile should be, which is shown here (The time paradox.com, 2017). From the ZTPI profile, it is indicated that an ideal BTP comprises a high score of PP (3.67), a relatively high score of both PH (4.33) and F (3.69), and a low score of PN (2.1) and PF (1.67), respectively. The ZTPI and BTP provides a leading framework to study the long-lasting topic of time perspective and happiness and also to propose useful predictors of happiness. There are still, however, some limitations that need to be considered, such as the generalisation and categorisation of ZTPI is not necessarily the universal one due to the subjective nature of this measurement. For instance, future TP is usually regarded as a positive term (e.g., hope and career success) in the original ZTPI, however, future TP can be in principle associated with negative terms, such as fear and anxiety. Therefore, future can be also further extended to future positive and future negative the same as past positive and negative, which was implemented and validated in the Swedish ZTPI conducted by Carelli et al. (2011). Another study of academically talented adolescent also supported the necessity of constructing a six-factor structure model of TP by considering negative feeling about future (Worrell & Mello, 2007). In addition, even though score of ZPTI provides a quantitative matrix of TP and happiness for easier comparison of different individuals and groups, the score scale may need to be adapted for samples from different backgrounds, such as, religions, education, social class etc. The corresponding optimised BTP score will also need to adapted for significantly different samples. Generally, ZTPI presents a fundamental framework for studying time perspective and happiness. More specifically, the BTP provides a vital guideline for individuals on how to achieve happiness, namely that past positive helps individuals establish a strong positive identity of themselves based on their own culture and growing experience, the present hedonistic lets them focus on their daily life and enjoy every moment of life, and the future makes them pursue higher achievement and maximise their human potential. For individuals who are too excessively involving in one TP to enjoy happiness, the corresponding time perspective therapy (TPT) may be needed. For instance, a more positive future TP was implemented to enforce the Future in BTP to balance the excessive traumatic PN in the study from Sword et al. (2014). Similarly, a future time perspective intervention was successfully utilised to increase study motivation of secondary students (Schuitema & Peetsma and van der Veen, 2014). Indeed, it is necessary to have certain interventions, especially for students as they are in the stage of developing time perspective, which can be significantly influenced by education and individual experience (Kruger & Reischl and Zimmerman, 2008). Every individual is pursuing for their own happiness during life even though they are may be under different paths. Evidently, there is a strong correlation between time perspective and happiness. The five factors of time perspective, namely the Past-Negative, Past-Positive, Present Hedonistic, Present-Fatalistic and Future can be a sensible predictor of happiness. Particularly, the balanced time perspective profile represents an important framework and guideline for studying psychological well-being. Corresponding interventions or therapy with consideration of culture, education and social class, may help individuals who are too biased in certain dimensions of time perspective to achieve optimal happiness and greater harmony in society. Fight for the future to maximise human potential. Boniwell, I. (2005). Beyond time management: How the latest research on time perspective and perceived time use can assist clients with time-related concerns. International Journal of Evidence Based Coaching and Mentoring, 3(2). Boniwell, I. and Zimbardo, P. G. (2004) ‘Balancing One’s Time Perspective in Pursuit of Optimal Functioning’, in P. A. Linley and S. Joseph (eds) Positive Psychology in Practice, pp. 165–78. Hoboken, NJ: Wiley. Hulbert, R. J., & Lens, W. (1988). Time and self-identity in later life. The International Journal of Aging and Human Development, 27(4), 293-303. Lewin, K. (1951). Field theory in social science: selected theoretical papers (Edited by Dorwin Cartwright.). Nuttin, J. (1985). Future time perspective and motivation: Theory and research method. Leuven;Hillsdale, N.J;: Leuven University Press..
Shores, K., & Scott, D. (2007). The relationship of individual time perspective and recreation experience preferences. Journal of Leisure Research, 39(1), 28. The time paradox.com. (2017). The Time Paradox Surveys. [online] Available at: http://www.thetimeparadox.com/surveys/ [Accessed 16 Oct. 2017]. Wassarman, H. S. (2002). The role of expectancies and time perspectives in gambling behavior. Zimbardo's books "The Time Paradox" and "The Time Cure"
This page was last edited on 23 November 2017, at 01:52.